If grease is packed into gear hub, then one of two scenarios will occur. Let's take a look at them. The first scenario is that there won’t be enough lubricant distributed to protect all the components in the gear hub adequately. Unless the gear hub is just packed to capacity with grease, the grease pretty much stays where it is put unless gravity pulls it downward. Even when it heats up enough to become much softer, grease won’t distribute evenly like oil. When the final drive initially starts up, you run the risk of dry running because some of the grease will have begun to settle. There simply won’t be enough lubrication to protect the components during startup or during operation. The result of this first scenario is premature wear, which then leads to catastrophic failure. The resulting repairs and replacements will cost much more than the downtime and expense of replacing seals and changing out the gear oil. The second scenario is a case of too much of a good thing. There can be so much grease that churning occurs. Then, at higher speeds, the gears and bearings will have to overcome the resistance that results from so much grease in the gear hub. Grease packing where gear oil should be used leads to a destructive cycle of increased friction and more overheating. The result of this second scenario is reduced performance, overheating, and premature wear of critical components like bearings and gear teeth. As we saw in the previous scenario, the repairs will be far more costly than replacing a leaking seal. Another problem with using grease instead of oil involves contaminants. It’s true that grease is going to be far less likely to leak out than oil, even if the seal has failed. However, if a seal is leaking, then contaminants like dirt, sand, and grit can get into your final drive. Grease isn’t going to keep those contaminants out. If anything, it may attract even more debris. Another issue with grease involves the difficulty of changing it out. 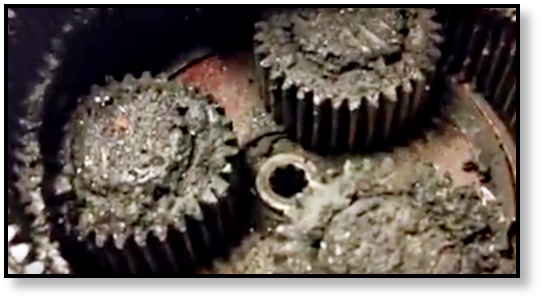 You need to disassemble the gear hub to clean out the grease and put fresh grease in; with oil, however, it is a simpler matter of just draining the oil gear oil out and putting fresh gear oil in. 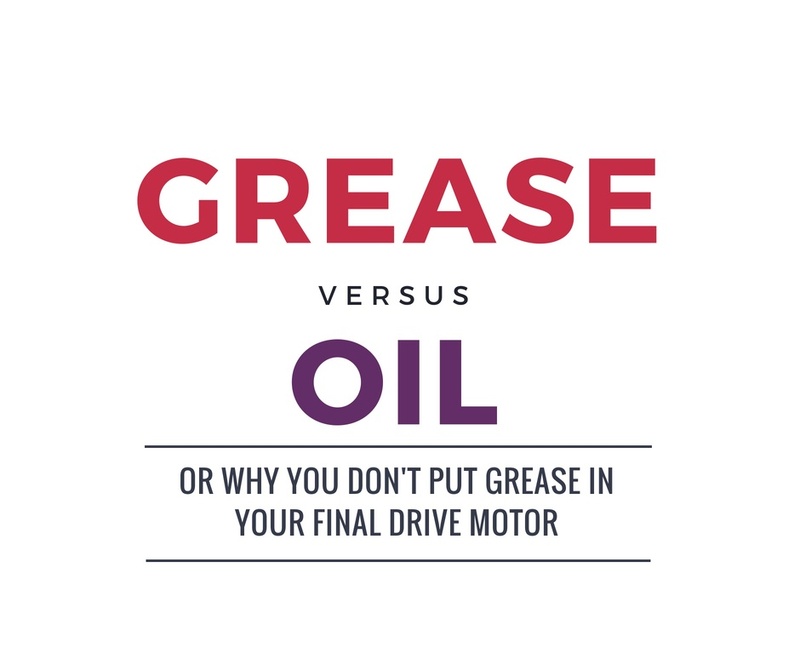 While it may be true that grease doesn’t need to be changed as often as oil, if you have a leaky seal then that grease is going to get contaminated and the components in the gear hub will be damaged. Final drive gear hubs were designed to use gear oil, not grease. 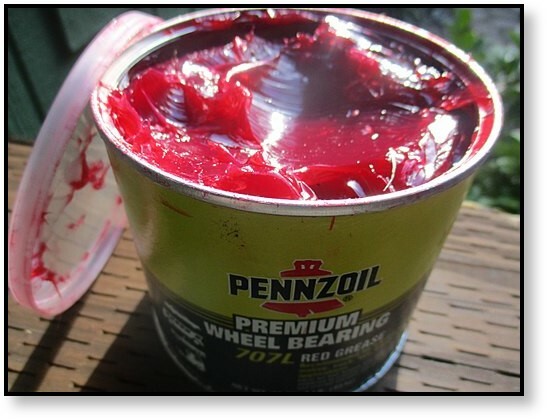 Grease is not a temporary solution to a leaking seal -- it can cause even more problems, and won’t fix the seal. Don’t put grease in your gear hub -- instead, fix that leaky seal and save yourself time and money. Here is an infographic summarizing the differences between grease and oil.